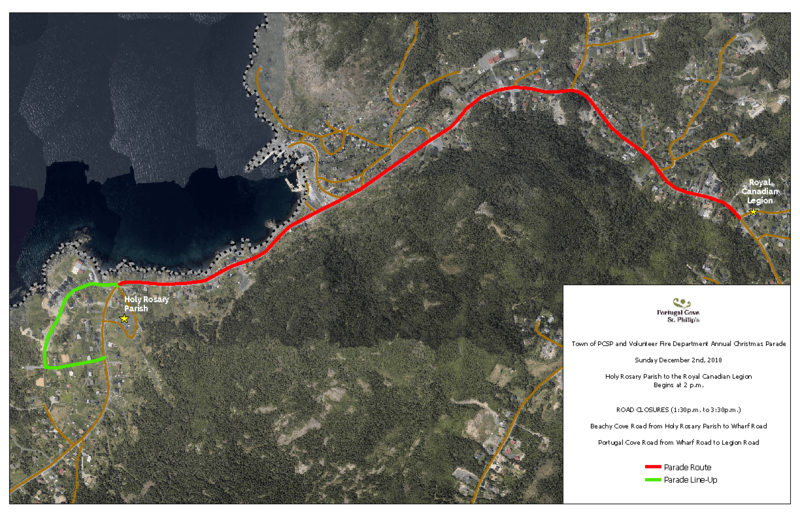 In the interest of public safety related to the growing number of parade spectators each year, and with the permission of the Department of Transportation and Works, Beachy Cove Road to Portugal Cove Road (ending at Legion Rd) will be closed on Sunday, December 2nd, 2018 from 1:30pm – 3:30pm to allow for a safe parade route. All smaller roads and side streets between Beachy Cove Road to Portugal Cove Road (ending at Legion Rd) will also be closed starting at 1:30pm. There will be signage and traffic control staff identified throughout the route for the duration of the road closures in order to ensure the safety of all patrons. Drivers are asked to please use extra caution on the day of the parade, as a large number of families and young children are anticipated to be in attendance of the event. For further clarity, please see the attached map outlining the exact location of the closure.